Address: 128 Dizengoff st., 47 Yirmeyahu st.
Japanika has many branches spread all over Israel, but lucky for us there are two of them in Tel Aviv! Japanika menu has a great variety of Japanese deliciousness. The dishes resemble a new type of Japanese fusion food, keeping the original Japanese delicateness intact. Their menu have sushi, sashimi, noodles and soups. The Tuna Tataki on a bed of marinated seaweed is really good. Also the 'new age' sushi Japanco is very tasty. You choose two types of vegetables and one kind of fish for your sushi roll, it's outer layer is dipped in panco (Japanese breadcrumbs) and fried. The result is a crispy but delicious tasting sushi roll. But our favorite is the Saki Teriyaki Roll. 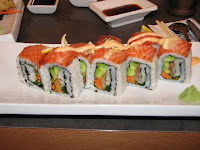 It's an inside-out roll with salmon, crispy salmon skin topped with spicy mayonnaise and a thin lemon that wraps it up. Delicious! The combination deals are good value for the money. You don't get specialties but a fine set of sushi, nigiris and hand-wraps. The Dizengoff branch is quite small, the one at Yirmeyahu is a bit more spacious and you have a great view of the HaYarkon Park. Japanika is a place that's always packed, so make sure you make reservations beforehand. 128 Dizengoff st.- Go stright north on Dizengoff, it's on the corner of Gordon St. The teryaki Salmon is indeed AMAZING! I take it everytime I go there. The tea is a bit overpriced there. Don't bother trying the tom yum soup....it's missing all the great fragrant ingredients and spices that make it so wonderful (usually).